In the Gospels, Jesus holds up a piece of bread and says, “This is my body.” Since the 1st century, Catholic Christians have taken him at his word. Catholics believe that Jesus is really, truly, and substantially present – body, blood, soul, and divinity – in the Eucharist. 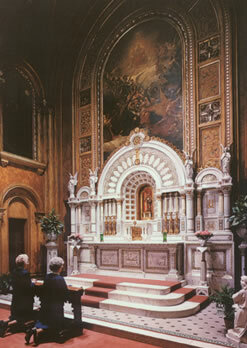 And so, though we can offer worship to him in all sorts of ways, showing our love for him while he is mysteriously present in the Eucharist has become a particularly important form of devotion. One group of nuns has taken this devotion to the next level. The group dates back to 1849 when a small band of women from Bavaria started the Sisters of St. Francis in Milwaukee, Wisconsin with the purpose of spreading the Gospel among German immigrants. In 1856, they started helping at a local seminary, but the work quickly became too demanding. With too much to do and unable to live a proper religious prayer life, some of the community’s founders left. The remaining women decided to refocus their mission and moved their convent to Jefferson, WI in 1864. Then, in 1871, they moved again to the newly formed Diocese of La Crosse, WI. But they were still searching for their purpose. In 1873, the head mother decided seminary work wasn’t the right path. She wanted the sisters to quit that work and find other work that would allow them to more easily focus on Eucharistic adoration. But not all of the sisters agreed, so there was a split: some left and formed a new group called the Sisters of St. Francis of Assisi, and the original group renamed themselves the Franciscan Sisters of the Eucharist. 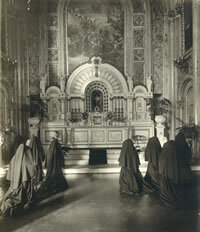 But it wasn’t until 1878 that the sisters discovered what would become their most famous calling: perpetual adoration. 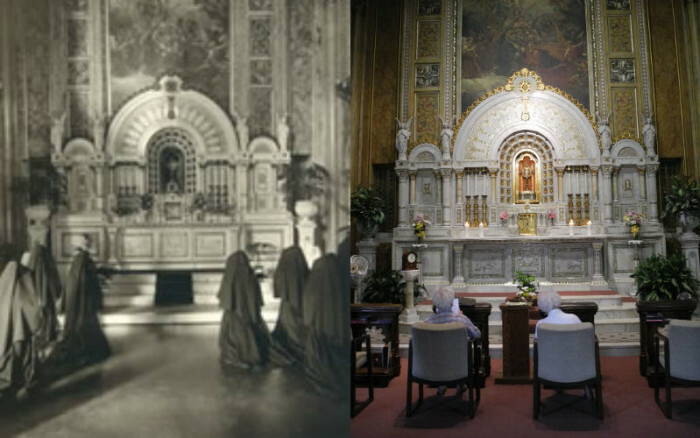 They committed themselves to having at least two sisters praying before the Eucharist 24 hours a day, 7 days a week, 365 days a year. No matter what. Indefinitely. They renamed themselves for the last time to reflect this new change in focus as the Franciscan Sisters of Perpetual Adoration. They started at exactly 11 AM on August 1, 1878 – and they haven’t stopped since. And it’s not like they haven’t had pressure to stop at certain points. In 1923, a fire broke out in an adjacent building. Their town flooded in 1965. There have been flu outbreaks, terrible storms, and of course world wars. But they always kept praying in faith. To keep it going, though, they have had to make a few changes. Their membership has unfortunately dramatically declined in the last few decades, and so, in 1997, after 119 years of the sisters handling the perpetual adoration, they reached out to their local community for help. Now, sisters and lay volunteers take turns at continuing the Eucharistic adoration. But it still hasn’t stopped! And as a result, they are believed to have the longest running continual prayer in the United States. They’ve had a particular focus on praying for he sick and suffering. They estimate they’ve prayed for 150,000 people in the last decade alone. If you have something that needs prayer (who doesn’t? ), you can fill out their online form and they’ll add it to their prayer list.